There are these points in time which are like moments of truth in investing/trading/speculating that I hate the most. The point where you have to take a decision and use whatever intuition, experience, awareness and knowledge that you have accumulated in your investing career till date. Where is a crystal ball when you need one? One such moment of truth that I am facing is what to do with my Gitanjali Gems holding. The chart below shows where the share price has come from historically. 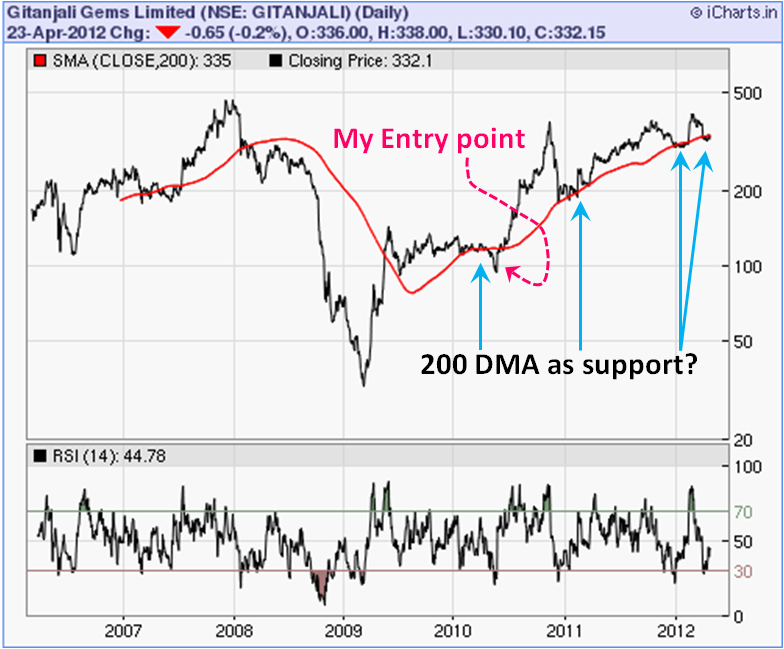 Looks like the 200 DMA line has been a good support in recent times and given that it is now poised on the 200 DMA makes me pensive. If you think it is a long term play – book some partial profits and hold on to the rest. If you have made looks like 200% then if you sell 1/3 you have recovered your capital..
Sound advise perhaps – and there definitely is a good school of thought which believes in taking out the capital invested and letting the profits run. Only in my case if I were to do this, I’d add my hurdle rate (my long term expectated rate of return that I wish to earn) to 100% and take out that % of my capital – ensuring that not only do I get my capital back but also the time value of money component. But my big problem with this approach is that once I have done that I am really back to square one. The feeling of having secured my capital is illusionary since I intend to remain invested in the markets for a looooong time to come. Who knows, I could end up sqaundering this recovered captial on a dud investment which could erode it quickly, stop losses notwithstanding. The truth is that I’d have to find another ‘sparkling’ idea like this one – or at least one that fetches me my expected rate of annualized return. That’s tough in today’s times for someone like me who cannot devote much time to studying the market. Caught between the ‘rock’ and a hard place I guess. Ultimately I have decided to do nothing and see if its breaks the 200 DMA conclusively. If it does then I guess I would fold completely.